An Australian remembers growing up in Prestwich. I was born at my grandmother’s house, 52 Clifton Road Prestwich, just off the village on Bury New Road. I came into the world during the war in 1940 we lived at 36.I spent my first few months, I believe, under the dining table, for safe keeping! I remember the ration books and the lack of eggs, sugar, butter etc. Today we have too many choices of food, and an abundance of it, even choosing a loaf of bread is not always easy. We (one brother, Roy and 2 sisters, Jean and Lynn) went to the National Infant/Junior school on Bury New Road. 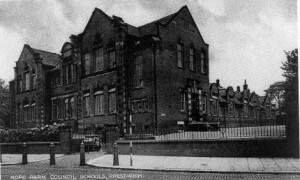 This was Prestwich Parish Church School which belonged to St Mary’s Church on Church Lane. Rector, Rev. Paton-Williams was always visiting the school and knew us all. The infants section was across Rectory Lane. I remember headmasters, Mr Blackburn and Mr Harding. We spent school holidays exploring in the clough, which seemed never ending then, and playing in the swing park. Sundays we would spend sometimes listen to a band in the flower park,visiting relatives or walking through Philips Park or Heaton Park. We couldn’t play on Sundays because we always wore our “best” clothes and could not chance spoiling them. I loved the Prestwich Band with the leader throwing up the baton, they would head up the Whit walks (Sunday was Prestwich /Friday was Whitefield) and the Prestwich Carnival. In hindsight it seems all the Summer days were sunny and it snowed every Christmas, I think that is selective memory. We would go up to the village and enjoy the carols under the tree outside the school on Christmas Eve. In the Summer I remember Mr Brindles’ shop between the Barclays Bank, corner of Clifton road and The Grapes Inn, corner of Warwick Street had the best ice cream. It was his own, home made and creamy yellow – yummy, delicious! We used to play on the street, we only had small gardens, there were enough of us to have teams to play french cricket and rounders. The No. 22 bus used to turn round at Prestwich to return to Victoria bus station and it would come down Clifton Road and up Chester Street. We used to hear it coming and jump off the road in time for it to pass. Also the “simi flyer” No.4 would turn around here – this was the little bus that ran from Simister to Prestwich and back. There were never any accidents, I think we were very lucky – and fleet of foot! The best chip shop was Smith’s in Longfield. We used to cut up Longfield to the railway station. In the winter in the 40’s we would buy coalbricks for the fire from the coalyards adjacent to the station. The Post Office was on the corner of Longfield. I remember the pedestrian crossing at the top of Clifton Road and always a policeman on duty before and after school, to take our hand to see us across the crossing. I went to Hope Park School for Girls, on the corner of Hilton Lane. I believe both the National and Hope Park have been demolished.I remember my junior schooling seemed happier than the high school days. I couldn’t wait to leave school, although I was a reasonable student. I was able to leave after my 15th birthday because I passed the Post Office exam to become a telephonist at the GPO in Manchester. Above : Hope Park Girls school. From 12 years old up to leaving school at 15 I delivered newspapers 7 days a week for Carr’s newsagency in the village. I won’t say it was fun getting up before the milkman, especially when the snow was deep, but it provided good pocket money, especially to go to the cinema, usually the Plaza on the village, or the Mayfair at Besses. I was able to go on a school trip to London due to my paper round. I also think some of the things we do in our formative years are very good for our self discipline. I remember when I was at Hope Park, I thought the school discipline was hard, but I have appreciated these lessons throughout my adult life as it taught me self discipline and a pride in myself. My first dance lessons were at the 279 club at Bury Old Road, Heaton Park. I loved ballroom dancing and took the medal classes, my name was still on the board there, 20 years later. The teacher was Len Levinson and my partner was Ian Metcalfe. We also went to the Saturday night dances at the Co-op hall, then discovered rock and roll and moved on, to the Plaza dance hall in Oxford Road. The DJ running the dancehall was JIMMY SAVILLE (who would have thought he would become so famous?) and he made the Plaza a fun place. When he was to be transferred we signed a petition to keep him. It didn’t work!! We used to go dancing at the Plaza in our lunch hour for 6d. I met my husband Bob at the Plaza, he comes from Salford. I loved dancing. I didn’t stay at the GPO very long, but worked in various offices on switchboard and reception. I always worked in the city, I loved the buzz of being part of the city. In January 1965, we emigrated to Australia with two daughters. In 1966 we had our ‘Aussie’ daughter. It was hard at first in a new land so far away from all the family and not knowing anyone, but Adelaide is a lovely city and a great place to raise a family. We live close to the beach, half an hour from the city or the hills, and 10 minutes from the National Park. have you got some memories of growing up in the area ? We would love to hear more from you or indeed anyone who remembers Prestwich and Whitefield in the sixties and seventies ( even eighties !). Nice to read your memories, Eunice. I’m typing this in Adelaide – visiting my daughter. Small world, eh? Hi Barry. Hope you don’t mind me butting in. Did you get a reply from Ken about Frank,I remember Franks toy shop across the road from where my dad, Geoff Grimshaw, worked and they were good friends. Be nice to hear from you. Dear Eunice you have brought some memories back for me and my cousin Heather Sant.We went to the National school and Hope Park.You may remember Sylvia(deseased)Susan,james ,and David we lived in Clough Walk very end of Gardner Road. You mention Smiths Chippy they were the best,but what about Buntins Pies.I can smell them now!! You wouldn’t recognize Prestwich now it’s not a quaint little village anymore. REMEMBER GREEK ELVIS’ CHIPPY (UMBRELLA)IN PRESTWICH VILLAGE!? HA HA. Hi Eunice. Reading your article brought back so many memoties. I had forgotten about the #4 bus. I also remember caling in at Buntings on Longfield to buy or get seconds of anything they had. Their custard pies tasted so good as did the oven bottom muffins. I felt so good after reading it all. Boy, what sweet memories I have of those days. Those were marvelous memories, did we all go to the same places? I went to the National School, same class as Jack Barrett, the Stand Grammar School and after that District Bank, later NatWest. Delivered papers for Carr’s but only on a Sunday. Had dancing lessons from Len Levison too. Spent most of my time at Prestwich Tennis Club. Brindle’s did have the best ice cream, but the bank on the corner of Clifton Road was the District Bank, Barclays was on the other side of the zebra crossing on the corner of Longfield adjacent to the old Post Office. Please forgive any spelling mistakes because my iPad is self correcting in American English. Forgot to say that I was born in 1945 and left Prestwich in 1969 to go to London with the bank to trade in foreign exchange. Have lived all over the world and am now retired in Florida. Good to see so many names of old friends I recognise! Hi! Wow it doesn’t seem so long ago does it?We all know what a good place Prestwich was to grow up in and I remember my days at the Nashy with great fondness, especially when we formed the Prestwich Swifts. Our first match was on the day City lost to Newcastle in the Cup Final and we got hammered 10 – 1 by Simister. Although we were only about 8 or 9 we transported ourselves on the number 4 from Chester Street in complete safety. We became a good team over the next 6 or 7 years with Duncan Smith the undoubted star and I believe he went on to play for England Amateurs. He’d be worth millions today! Hi,if it is the Duncan Smith you are speaking of,he came to Sedgley Park RUFC and played full back in the first team for a good many years.he also played for East lancashire.his goal kicking skills are legendary. Interesting to read of the National School (Nashy to us)- I was there from 1940 0nwards. When it was demolished, I was regretably just too late to buy one of the clock faces, which were so prominent in the village (well it was a village then!). I remember Mr. Blackburn, and being caned by a Mrs. Dawson (who on reflection must have been a sadist).It is a great pity that the National was not saved in some form, and my next stop at Stand Grammar school suffered the same fate. In that case the extensive grounds were ripe for Bury Council sale, and their progressive retrograde changes, and final sale of the school were diabolical in my opinion. Prestwich was a grand place to grow up, and the Buntings shop, Plaza picturehouse, the Clough and the Nashy are fond memories. Hello Eunice, I enjoyed reading your memories of growing up in Prestwich. I was born in 1952 so I’m younger than you are. Although I come from Whitefield I went to school at Our Lady of Grace on Fairfax Road, eventually moving to the huts. I can still see Hardman’s Road as it was before the motorway. We would go on nature walks down Philip’s Park. I can still see in my mind how Prestwich was before all the changes. What a pity things have to change so. Visited Prestwich earlier this year while on holiday from Florida, where I now live. First time back in about 20 years. My goodness how things have changed but I was not surprised because I had researched the changes on Google maps. I can’t believe the state of the shops on Bury New Road, is this because Prestwich is now governed by Bury and we are too far away for them to care. If I still lived there I would be asking my councillors to do something about it. At least on my visited I went to my old stomping ground of Prestwich Cricket and Tennis Club and at least their changes have been all for the better with a great cricket pavilion and refurbished tennis courts; I do wish that they still played tennis wearing whites as they did in my day, but then I am a traditionalist. Good stuff. The 22 bus was necessary to cope with local Prestwich folk going to work in Manchester because the buses from Whitefield were often full by the time they reached Tower Buildings. Once it failed to arrive during a morning rush hour and several of us were left stranded at the bus stop by St. Mary’s Park for about half an hour before we could get on an alternative 17, 24 or 51 which came from Thatch Leach Lane. The 33 went to Polefield up Heywood Road. The 35 which went up Bury Old Road was a joint Manchester (red)/Salford (dark green) and Bury (light green) route so you never knew which colour to expect. For reasons I never understood, the first number 4 of the afternoon to Simister always started at the top of St. Mary’s Road instead of Prestwich Village. Does anyone know why? When the double yellow lines first appeared on Bury New Road I stupidly said to Mr. Carr of Carr’s newsagenets what a good idea it was because it kept the traffic moving. He didn’t agree because he lost a large amount of passing trade en route to work in Manchester. The preferred chip shop for Bury GS boys on their way home from chess matches on Friday evenings was the one on Bury New Road run by two ladies. We always thought they gave us extra chips for being friendly! Does anyone remember the barber on Longfield Road? Thanks for the memories Peter. The chip shop you are referring to was almost certainly Barlows where a number of us went after cubs at Heaton park Methodist Church on a Wednesday night. One of the ladies had an arm missing which, to nine year olds, was absolutely fascinating as we didn’t realise that somebody like that actually existed on earth, never mind in Prestwich! On the same block (opposite Prestwich Methodist Church) was a newsagent run by Neil Collier, Jack Colam’s Fish Shop, a photographers,a flower shopand a pet shop on the corner of Clarks Hill (we got our first dog from there in June 1966) I also went to the Natiional and tjhose cooments about it being knocked down are only half correct- it was the Junior section on Bury New Road that was demolished. The infant section on Rectory Lane is still there and, with extensions, now holds the complete Primary Age Range. Will write a lot more next time. Regards. Hope that you’re keeping well Peter. I remember the barber’s shop on Longfield. It was run by a guy with a full head of black wavy hair and a moustache. He had a disability and I think that he lived in Crumpsall. Just a couple of random notes. Does anyone remember my Uncle Fred Halliwell? He ran the Co-op fish shop for over 40 years. I also remember the rag and bone man, Paddy Wallwork. Peter, the barber on Longfield was Mr Dronsfield, I believe. I used to go to Fred Cole opposite Tower Buildings but occasionally went to Mr Dronfield who after cutting your hair would singe it with a lit taper, used to scare the you know what out of me. I used to take papers for Harry Carr, but only on. a Sunday morning as I could earn as much then as taking papers every day during the week. Good to hear from you Paul Sanderson. I remember when we both used to dream of opening the batting for Lancashire and England. I’ve lost touch with everyone but browse this site from time to time to see if any old friends have posted comments, it appears that there are a number of people from our era still around. Who can forget Sammy Woodward, he made a lasting impression on all our lives. I hope you are keeping well. Glad to hear from you Paul. I was in 15th Prestwich Cubs and Scouts – I believe that they have merged to form 22nd Prestwich (7+15!!) I live in Florida and each year drive up to Massachusetts to see family, I was thinking that this year I would stop in Virginia on the way back and visit Agecroft Hall, it was not around when we grew up as it had already been shipped to the States. I wonder what reaction I will get when I go there and tell them that I am from Prestwich. If I’m right I used to live next door to your Mum and still have your old Scout Belt which she gave me about 30 years ago! I went to the 22nd as it was and still is. I’m still involved in Scouting and still live in Prestwich after a few travels! Hope you are well, last I heard of you was when you were still based in the Gulf. With fond memories of my early days in Prestwich and delight at discovering this site (quite by chance when searching for pictures of the Bury-Mcr electric trains from the ’50s) I’d like to say a very warm Hello to all in my class who may remember me. Andrew Whittaker – Andrew, I well remember your house Chetwynd Bank, on Prestwich Park Rd South & your dad was a butcher, his Consul was reg GRJ 901, and riding up your very steep drive on my bike … and also watching the ’55 Cup Final at your house, since which time I’ve been a passionate City fan … IT’S ALL YOUR FAULT, ANDREW, that I’ve has so many years of misery as a City fan, although I’m clearly enjoying the sunny days we’re currently experiencing! Remember Barry Noden (tall) – Barry – we had some schoolboy scraps – you won! Paul Sanderson – Paul I spent ‘years’ at Stand Cricket Club trying to bowl you out. We took batting and bowling in turns and that meant you batted for about 90% of the time! Didn’t quite realise the prestigious role Lynn’s Dad, George, had at City, banging in the goals – including (I think) 4 in one game against United!!!! Sorry to see he’s recently passed away. Remember Billy Fry, Peter Davies, Sheila Roberts, Hazel Middlehirst and more ….. Sadly, I have nothing like fond memories of Sammy Woodward (he had too many favourites) – the blighter sent me out of class for some (obviously major) misdemeanour (???) on the day the school class pics were being taken. I was at the back of the cloakroom when all the rest of the class trouped out for the pic, and when I see that pic here on the site, I experience angst (GRRRR) at his inability to bring me back into the picture – Gawd, can I really carry such annoyance for 60 yrs? Apparently so!!! So … enough for now. Have I exceeded my allowance? I guess I’ll be a visitor to this site from now on. If anyone wants to make contact, I’m on 01565 633788 in Knutsford. Happily married for 44 yrs with 2 kids & 2 grandkids – sadly, grandson Oliver seems like he’s a chip off his grandad’s block! Crikey – I must have caught the Prestwich bug. Filled with all the emotional leftovers from my recent post above, I went with my wife Pauline for a very enjoyable look around Prestwich last Saturday (it was pouring down!). Went to see my childhood home on Willow Road (opposite what was the Hospital) then ended up taking pictures of all the road names I recall – Nursery Road, Poppythorn Lane, Gardner Road, Clifton Road etc. Sad to see the site of one half of the ‘Nashy’ (I forget which one it was – Infant or Junior) badly overgrown and neglected since its demolition, but with HUGE trees – how long ago was the school demolished? – seems like it must be 30 years for vegetation to taken hold like that. Everywhere I went, people seemed curious at why I was taking pics – at Frank’s house and Andrew’s house (see above) the current owners came out and were very chatty about my past connections. The station seemed so changed – rather than a coal yard next door it’s all surrounded by mature trees – rather ‘rural’ (not). Had a lovely Italian meal at Croma on Fairfax Rod (will go again!) somewhere behind where the Tower Buildings were. Some old Mcr Corpn buses went through the village whilst we were there – apparently on days out from Queens Road Transport museum – reminded me how many times I leapt onto the platform at the back to catch a bus – not quite what Health & Safety would allow to day. To repeat what I wrote above … if any of you are remotely near Prestwich or Knutsford on return visits, PLEASE, contact me. Would love to renew old acquaintances or start new ones. Still in v close contact with 5 pals from my school at Lord Wandsworth College in Hampshire (going to 50th anniv of leaving this June) – I’m sure I can find an equally desirable slot for any ‘Infant/Junior’ pals (or palsesses!) who may wish to get in touch. 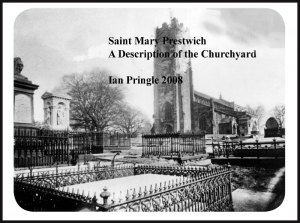 It’s Clough Day ( a celebration of Prestwich) this coming Sunday ( 18/5/14)in St. Mary’s Flower Park. We have a stall in the Marquee. Did you live at 13 Sunningdale Dr because when I left Prestwich the Dixon’s were at number 9 and the Stalkers at number 13 but I think I remember my mum mentioning you. She died in 1991 when I was in Abu Dhabi having suffered a stroke in 1987 and living in a nursing home. I finished in the Middle East (UAE and Kuwait) about 10 years ago and live in the Tampa Bay area of Florida. Good hearing from you. I have very fond memories of Prestwich Parish School. I was born in 1948 I was only there for 2 years, from age 5 to 7. My best friend was a very sweet girl called Hazel Doubleday and after I left we corresponded for several years. Does anyone remember her? My brother Michael (b 1943, my sisters Haroulla (b 1945) and Mary (b 1950) all attended the school. Mary was in the Kindergarten section only but Michael and Haroulla were there for a few years before we left Northumberland St. to live in Heaton Moor, Stockport. I remember the Coronation. I remember a lovely, kind teacher in the 1st year, don’t remember her name. I remember having embroidery classes on Wednesdays and being frightened of the elderly (or so she seemed to a young child) teacher who was very strict. In the mid 80s I came to live in Cyprus (my parents were Greek Cypriot). I return to the UK every year. I have a class photo of when I was at the school which I treasure. Does anyone remember me? Hi Soulla. Just had to write to say I do remember Hazel Doubleday, its an unusual name and sticks in my mind, wonder if shes still around. I went to the National and I was born in 1949. Hello David, just wanted to say that I found Hazel, or she found me. So pleased, in fact last year when I was in the UK, we met up after 60 yrs She’s well & we were remembering old times. We have been corresponding ever since & plan to meet up again this yr when I am in UK. Paul mentioned her brother, she had an older brother at the school. Nice chatting to you. All the best. I have very fond memories of Prestwich Parish School. I was born in 1948 I was only there for 2 years, from age 5 to 7. My best friend was a very sweet girl called Hazel Doubleday and after I left we corresponded for several years. Does anyone remember her? My brother Michael (b 1943, my sisters Haroulla (b 1945) and Mary (b 1950) all attended the school. Mary was in the Kindergarten section only but Michael and Haroulla were there for a few years before we left Northumberland St. to live in Heaton Moor, Stockport. I remember the Coronation. I remember a lovely, kind teacher in the 1st year, don’t remember her name. I remember having embroidery classes on Wednesdays and being frightened of the elderly (or so she seemed to a young child) teacher who was very strict. In the mid 80s I came to live in Cyprus (my parents were Greek Cypriot). I return to the UK every year. I have a class photo of when I was at the school which I treasure. I remember the Solomon family. Haroulla was in my class at St Marys and I visited them at their home in Northumberland St; I lived nearby in Wellington St West, Salford. I particularly remember the special Greek sweets they enjoyed. I remember Michael and I think Haroulla brought Soulla to my house once. We occasionally caught the same bus to school from Market Place, Salford up to Tower Buildings, Prestwich. Our Headmaster, Mr Harding, was sometimes on the same bus! I have Haroulla’s signature in my autograph album. You are welcome to pass my e-mail address to Soulla. Road…I have now come full circle! Having lived in Longfield for my first 12 years I vividly remember Smith’s chippy (Robert Smith was my brother Ian’s friend, Young’s chippy further up the street, Alfie Whittaker’s sweet shop, the off licence run by a lovely lady called Barbara Taylor. My nana lived next door to the barbers shop, and my cousin Keith and I used to play knock and run on his back door….when he caught us and told us off we posed ‘poison pen’ letters through his door! Wicked children. Such happy, memories. They really were THE GOOD OLD DAYS. Living once more in the village, I can relive those memories daily. I walk my dog in the Clough, Mere Clough, the flower park and the swing park. Yes certain things have changed, but it’s still a nice place to live, and is certainly improving each year with new shops opening. My old haunt the Church Inn is still our local pub, and unless I win the lottery and clear off to Greece, I’ll be here for good! Hi Lynn. The name Geoffrey Bowler rings a loud bell so I’m racking my old memory. When you went to Stand Grammar in 1960 do you remember a girl called Beverly Preedy as we went out later on for quite a long time? Also the name Barbara Taylor rings a big bell as well, did she live with her dad over near Heys Road area, think some of her friends were Susan Smith who lived 5 The Terrace and Shirley Chadwick who lived on Bannerman Avenue? As you used to go in The Church Inn do you remember Bernadette and Francis Tracey? Be nice to hear from you. Dave. Here are sixteen photos to refresh your memory.sign in to use their zoom facility.Click and drag the photos to focus on detail.You can add a pin or make comments.best on a PC. I lived in Prestwich 1956 or 7 to 1960 (aged 9-12), in Mountside Crescent. My dad, Fred Keating, was a reporter on the Prestwich and Whitefield Guide. I went to the National School under TWK Harding, and listened to Livin Doll in the doorway of the record shop. Went to Stand Grammar, Miss Woodmansey’s class, then Mr Baxendale. I could see the church from my bedroom window. My best friends were Marilyn May Mirfin, who went to Hope Park, and Margaret Roberts, and Vivian Walsh. I walked to school with Gina Kaye, the doctor’s daughter, and then went to Methodist Guides, minister Foster-Elves. Lovely to read all the comments. Hi Jennifer. I noticed you lived in Mountside Crescent, if you remember the narrow steps that went up to Gardner Road and got to the top of the steps my granddad and grandma lived in the end terraced on the left and I built a bogie with 4 pram wheels and went down Mountside Crescent on it, it was great in those days, about 1958, hope I didn’t knock you down. I must have gone to the National about the same time as you but left in about 1958/9 to go to another school. Did you know Jeremy Kaye, Ginas brother..Dr Kaye was my doctor and when we used to go and see him he was smoking and had a glass of whisky…good old days, he used to have a large bonfire behind his house on bonfire night, I was good mates with Jeremy. Can not believe I have found you still alive and kicking living in Bury where are you? What memories but most a little after my time. I was born 1936 at 3 Ruskin Crescent (off Ruskin Road) down at the end of St Ann’s Road. I attended Park View School but most of my palls Glyn Evans (mentioned above and we are still in contact) and Fred Elleray (now deceased but went to live in South Africa) all went to the Nashy. I was a member of the Hedysians Youth Club and St Mary’s Youth Club which held meetings in the Nashy. Incidently someone has suggested that the 22 Prestwich Scouths might have been allocated that Number because of the amalgamation of 7th and 15th. Sorry that was not the case 22nd was the next number to be allocated at the time – the 7 plus 15 remains a great talking point and in some ways keeps memory of the two old groups. Lots more memories to submit ‘Watch this Space’. Fred, do you remember me. You used to collect pools money from my dad in Sunningdale Drive, every Friday. When I was in Sammy Woodward’s class at the National, must have been summer 1956 or thereabouts I was asked to host a German boy who was coming over with his youth club from Wandsbek, Hamburg. He was the brother in law of their pastor and I remember going on a trip to Blackpool with them and St Mary’s Youth Club, you were there too. Two years later I went over to Hamburg. I was the one who thought that the scouts was an amalgamation of 7 and 15 as I like to play around with numbers. Hope you are keeping well Fred. Hello I have just found your forum by mistake.I could not sleep the other night and all things going through my head and it turned to people I went to school with so at 2am I got up to look at my laptop to see if an email had gone to Australia and then I put in National school and hey presto I found you. I was born in Hardmans Road Besses oth Barn and attended the Nashie from 1942 going into Mrs.Evans class.I left the Nashie in 1950 and went to Heys Road.Mr.Blackburn was my headmaster and also a friend of my fathers.I spent 1 year at Heys Road before leaving to go boarding school in Buxton,this is when I lost touch with school friends.I school in 1955 and joined the family stone masonry firm as an apprentice stating at the bottom brewing up for all the staff,the yard was at Whitefield goods depot.I ended up going all through the firm and even helped rebuild Manchester Cathedral after the bombing. Talking about Longfield the chippy was really good and I used to go to Buntings every Saturday with my Granny and I believe we were related as we used to go into the bakehouse and get our order.I met my wife at the Coop hall in 1956 in the days of live bands we were married in 1960.We used Barbaras off licence and in 1963 I towed a lady from outside who had broken down,that then gave me a chance to change job direction,I then set up on my own building sectional garages and repairing the blue invalid carriages and electric wheelchairs.Then in 1978 another change when they started giving Motability payments we bought a Tyre and Battery Centre in Rhyl North Wales.We expanded this by starting a Land Rover spares business with daily deliveries to the whole of North Wales and even exporting to Tanzania.I have been a Land Rover nut since 1963 and still am.We sold our two business in 2002 and then I helped out at other jobs driving and printing. Getting back to people I remember teachers at Nashie Miss Lightbown Mrs Dawson who used to throw the board rubber.School friends include Norman Long who used to live at the top of the steps by Colmans fish shop then Martin Davies who lived in a street opposite Fred Worths tobacconists Jackie Roper lived just off Heys Road and Ann Duffy and Rae Mcgregor. I remember the 51 bus starting and was on it, the bus stop being just down from my house,the top floor window being smashed by a tree at the bus stop. We still live in North Wales. Hope this is of interest. Have you any photos of those days? Do you know where Nuttall’s business records went to of the masonry firm ? Was the firm involved in things like war memorials and prominent buildings in Prestwich and Whitefield ? Nuttall Avenue on the railway sidings site is presumably named after your family ? I have put your post on our Facebook page so you might see some responses there. Hi thank you for your reply.Somewhere I have got a photo of the firms first lorry and the brass plaque off the front of the office which was opposite the Masons Arms.I had started on my own when the firm closed and do not know where records went.The firm was mainly into buildings we built mainly in Manchester rebuilding Manchester Cathedral,the Free Trade Hall my father laying the foundation stone with Princess Margaret and I think I have the masons mallet that they used,we built Ship Canal house on Kings Street,the Midland Bank next door(I think), the Ryland building at the top of Market Street,the Town Hall extension in Albert Square also I rebuilt the statue in the square that was knocked over by a lorry I have newspaper cuttings of that,the fountain i Piccadilly Gardens closer to Whitefield we built the Whitehead Clock in Bury next to town hall we may have had something to do with the town hall.We worked on a lot of churhes rebuilding tracery windows.The only war memorial I worked on was at Lancashire Fusiliers depot at Bolton Road Bury.Yes Nuttall Avenue was named after the family and we are on the plaque at Morrisons supermarket.The family also owned Jacksons joiners and undertakers on Livesey Street and E.Schofield based under our offices.Do you have meetings ? I go to history society in Rhuddlan. Hi you old Prestwhichonians. I went to Hope Park 1951-55. For m sins I was Mrs Standish’s prefect. My brother was the late Derek Bennett and my sister Wendy Bennett. A few of us get together from time time. On 13.06.2016 we are having a school/local reunion in Prestwch. If you wish to attend please email me. As I have previously said from1950 onward I lived on Butterstile Lane. Our section of the lane from Sandy Lane junction to Agecroft RoadWest was amass with youngsters all around the same age..and the majority were boys,there must have been something in the water. We played football morning ,noon and night on Butterstile Park which lay between the lane and Hillcrest Road.. it was not unusual to see 20+ young lads kicking the ball around with great purpose whilst the girls played on the swings and roundabout. I believe it was my idea to start a team and apply for entry into the north Manchester junior league. We could at a pinch have formed two teams but logic dictated one good team would be best. Our application was successful and to our surprise we were allocated a pitch on Grimshaws for our home games. Other teams in the league for the1957/58 season … Bowlee Mission, Prestwich Villa run by Paul Byron’s dad, Marwood. Prestwich Central and Besses Boys.The names of the others have for the moment gone. From our point of view the season was a total disaster..we lost every match and our best result was a 6-2 loss to Villa . Some of our other results should not go into print. That was one one and only season and sadly filled with dissolution we resigned. Who remembers or played for teams aforementioned? Great times for 15 year old lads..and so back to Butterstile Park..at least we could only beat ourselves With best wishes. A place fondly remembered by all who passed through it’s doors a wonderful club which came along just at the right time…frequently said by others,”it was exactly what we needed back then”.Indeed it was. Without doubt quite unsurpassed in our locale and for miles around. It all began in the early spring of 1959 courtesy of AlanCole who ran the “Cremery” grocers shop on Sandy Lane near it’s junction with Butterstile. It was Alan’s idea .Initially he sounded out the opinion of a group of us and naturally we were all in favour. For those who are not sure the club used the Hall next to the Methodist chapel on Bury New Road in Sedgley. So in the beginning six of us helped him get it off the ground that seemed the right thing to do each of us making a contribution as best we could. I was not a DJ but music and records where in my blood so l took responsibility for that area..incidentally ,at that time Australian singer SlimDusty was in the Qqpwith his little ditty “A Pub WIth No Beer”a particular favourite with the boys. To play the records I used my excellent ‘Fidelity’record player a step up from the very popular ‘Dansette’…I was told the music I was playing was superb the best we’ve heard at any YC. With praise like that heaped upon me I had to make every effort to keep my record collection fresh and up to date providing a good mix of US and British sounds. By the middle of 1961 the club was thriving possible at it’s height over a hundred keen and eager teenagers attending each Wednesday evening. Other clubs in the area, St. Andrews on Venwood Road and The Servite club on Cavendish Road were good places to go but ours was the in-crowds choice…did you go to any of these clubs or know anyone who did ? It would be great to hear other accounts. So then, what made the club so popular?..was it the music?, perhaps.,was it the dancing?, could be , the table tennis?, darts,or the snooker or how about the refreshments? My best guess is that it was a combination of all of these add the fact that young people have always wanted to be with others like them especially then when everything was run by their parents generation. During 1961 things started to change. We noticed a decline in attendance figures without doubt due to the new music venues down town,eg, The Oasis and the Three Coins. Nevertheless we have to be ever thankful for the marvellous times we had. Many others just like me must have fond memories of the Milk bar In Sedgley Park I’ve seen it mentioned a couple of times in letters. does anyone know? My earliest recollection of a visit is around 1956. A couple of years later I was a frequent visitor as it became a place to convene a designated meeting place mainly for our age group,16 to 19. At weekends it became one of the in-places to go in exactly the same way as Sedgley Park YC did in 1959. If you wanted to mix with your contempories for a good laugh and a joke catch up with the latest gossip and party info then this was your place. Proprietor Alf Else along with daughter Mary and occasionally sons Jon and Mike kept things ticking over… a hot black currant drink perhaps a coffee or a delicious home made ice cream lasted for far longer than intended although to be fair many of us did request another. There were many regulars perhaps too many to recall here however, a good cross-section of names would be; Joan Smith,Dave Solomon,Merv Cretney,Pamela Wilkinson,Rita Sambrook,Sue Hopper,Dave Clarke,Lenny Webster,Granville Leather,plus my best pals Mike Towey, Mike Lilleywhite and the late Bob Sharpe and Peter Wilkes( RIP). From about 1958 through to 61 at certain times of the week Sedgley Park became the hub of teenage activity… and without any unpleasantness or rowdiness. Both the Milk bar and the Youth club played their part in keeping many Prestwich teenagers pleasantly engaged…can anyone recall those times? Dear all, Apologies for the fact that recently I’ve had a few issues with my I-pad so I’ll re-do the Sedgley Park YC letter. The club came into being during the spring of 1959.It was the idea of Alan Cole who ran the “Creamery” grocery shop on Sandy Lane between Lowther Road and Butterstile Lane. Initially he sounded out a small group of us and naturally we were all in favour. Things soon got moving. The Methodist church hall on Bury New Road Sedgley was the weekly Wednesday evening venue… we had table tennis, darts ,billiards, music and dancing with refreshments as a bonus I was not a DJ but took most of the responsibility for the music using my superb Fidelity record player a step up from the popular Dansette. I kept my excellent collection of 45s fresh and up to date. By mid 1960 into ‘61 the club was thriving with over a hundred coming in every week. The Servite club and St Andrews on Venwood Road were good and well run on Sunday and Thursday respectively but we had the edge! So we have to say thanks to Alan Cole…his idea his time and effort and his belief that it would be a success..Oh Boy was it just! Greetings to one and all. It is a sad fact that some of those whose names Iv’e listed below will no longer be with us. I know of three for certain. I am now 76 so consequently the age range of these-my contemporaries would be 72-80. So then looking back to the mid 1950s…who lived where in the Butterstile Lane locality? Let’s start with Agecroft Road West where we had Peter Winter,Elaine Pickston, Graham Simpson and Mervin and Niva Parrish. On School Grove-Mike Entwistle, And Peter and Susan Hutchinson. On to Sandy Lane and Brenda and Rose Nolan, Jacklyn Daber,John Law,Pauline Hopkinson,Ronnie Telford,and Christine Lee. Ladythorne Avenue and Ladythorne Drive had Joan Crowther and Ruth Hobson though I’m uncertain who was on which. I believe the Beardall sisters lived on Headlands Drive. Stephanie Proctor lived on Lynmouth Grove and Ivor Collinge on Carr Avenue whilst Jackie Milner was on Scott Road. Up to Hillcrest Road next..Vic Dunnercliffe,Alan Evans,Valerie Taylor and Kathy Sheard. Round to Venwood Road to find Andrea Kincaid,Rowena and Lorraine Bowden and on Grundy Avenue Pamela Constadine. Jennifer Halliwell was possible on Woodward Road. And so on to Butterstile Lane… long list here~Colin Rogers, Colin Rowley ,Josie Rowley and Keith Rowley, Jeff Cain, Stuart Turner, Ian McClelland, Peter Croft, Dave and Barry Smith, Neil and Ian Horbury, Bryan Sly, Ted Horton and brother, Carol Warner, The 3 Dearnally girls, June Plaskett, Roy Thomas, Colin Andrews, Maurice and Isobel McKinnell, Jimmy and Irene Lynn,Barbara Monks, Rodney Allen, Peter Lomas, Peter Hayes, Mike and Norman Bolland and yours truly. Hilary Simpson lived on Overdale Road as it once was however,it became the continuation of Venwood Road but I cannot put a date on it, Valerie Stopford likewise. Can anyone shed light on that?